Movie Review: “The Hateful Eight”, Quentin Tarantino’s stupefying successor of “Django Unchained”, is blatantly more controversial than the latter, sarcastically blending delicate topics like racism and sexism with others, usually picked to infuse some morality in the tales, such as greediness, dominance, and subjugation. Taking advantage of his huge capacity to disconcert the viewers with fulminant action scenes and zesty dialogues, the celebrated director ridicules pain and human disgrace in such a way that it’s impossible not to laugh, even when the jokes jump out of the bounds of good taste. He deliberately makes use of the same hilarious tones and erratic routines as in “Django”, but this time, confining his eight untamed characters to a stagecoach stopover called Minnie’s Haberdashery. This way, he fabricates a sort of “Reservoir Dogs” from Far West. Divided into chapters, this three-hour mystery western set in the freezing post-war Wyoming, starts when the inexorable hangman, John Ruth (Kurt Russell), is heading to Red Rock, where the insolent tramp lady, Daisy Domergue (Jennifer Jason Leigh), who travels handcuffed to him, is going to be hanged for murder, guaranteeing him a large financial reward. Along the way, while running from a menacing blizzard, they bump into the General Marquis Warren (Samuel L.Jackson), a tricky black bounty hunter and ex-soldier who's popular for carrying a personal letter written by Abraham Lincoln. Later on, they’re joined by Chris Mannix (Walton Goggins), another cynic who adopts a fearless posture against the hangman’s hostility while brags he’s the new sheriff of Red Rock. 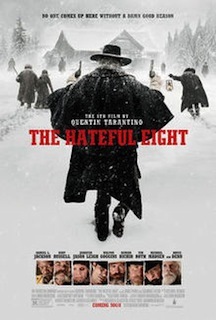 Forced to stop at Minnie’s place, the trio will find three strangers – the Mexican Bob (Demián Bichir), the cocky British hangman, Oswaldo Maubrey (Tim Roth), and a cowpuncher called Joe Gage (Michael Madsen) – who coexist with the habitual presence of the quiescent Gen. Smithers (Bruce Dern). Strangely, the owners are absent and some of the new faces are seen as pretty much unusual. As expected from a script by Tarantino, this is nothing else but a deranged conspiracy that ends up in a few violent, blood-spilling deaths. Jennifer Jason Leigh is particularly remarkable, whether when acting cunningly or playing guitar and singing with a sweet voice, or even when exhibiting her face washed in blood, in an allusion to Stephen King’s Carrie. Tarantino’s eighth feature entertains continuously while using the same far-fetched puppets to fill his barbarous scenarios.